I don’t know if 2 movies of the same genre are the start of a trend but I hope so. During the second week of May I went to see “Five Flights Up”, a movie about an elderly couple together for forty years with neither dying of Alzheimer’s or any other ‘old people’ diseases nor were they battling with being an inter-racial couple. They were a pair who made and enjoyed a life together the only trauma being of the old man and their old dog having to climb 5 flights of stairs. The leads were played by Diane Keaton and Morgan Freeman each looking and feeling comfortable in their long term relationship and the audience believed in them. 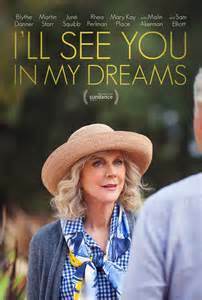 This week I saw “I’ll See You In MY Dreams” with Blythe Danner sparkling in her role as an independent woman, a retired school teacher, who, when younger, had dabbled as a band singer, now a widow for 20 years, has a daughter who lives on the other coast and they maintain a mother/daughter relationship and friendship. She lives in her own home having enough money to maintain it along with hiring a pool boy. Her major conflict at this point in life is that she may have to put down her beloved Hazel, a dog, of 12 years. Just watching the light go out of Danner’s blue eyes as the procedure is done is the dramatic moment of the movie though other things do happen. Danner plays cards with her girlfriends June Squibb, Rhea Perlman and Mary Kay Place, all who are trying to get her to move into the retirement community where they live. These are women who have adapted to being seniors who can get goofy on medical marijuana, go on a speed dating romp, play golf, talk a little ‘naughty’, drink some, well a lot, of wine. When Mary Kay sees Danner’s pool boy leaving her house early one morning she is not above thinking what most women would think and when a handsome, virile looking, possibly Mr. Right in the form of Sam Elliot shows up in a meet cute scene you think you know where the movie is heading just as you might justifiably think you know what will happen between Danner and the pool boy Martin Starr when they go to a karaoke bar on what might be or not be a date. Directed by Brett Haley, who also wrote it along with Marc Basch, this is not a Golden Girls television situation comedy or a cougar and young man story or woman desperate for another man to make their life whole. This is a film, like “5 Flights Up”, that looks at a group of people who have lived most of their life, are near the end, and still find aspects to explore. Actually along with “Love Is Strange” starring John Lithgow and Alfred Molina, these pictures show professional actors who have always supported others with first class work now doing the same with and for others giving themselves a chance to be the stars they are. PS No one ever made scarves look as good as Blythe Danner’s face and eyes do!